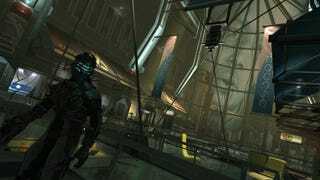 Dead Space 2 seems every bit as frightening, as innovative as the original. Developers Visceral Games still lean heavily, and quite successfully, on clever use of lighting and sound to create a constant tension in the creepy, space shooter. While you still play as space engineer Isaac Clarke, this time around the search for answers and the hunt for deadly Necromorphs isn't limited to planet-cracker Ishimura. Instead, you find yourself on the Sprawl, a floating city that orbits Saturn. The new setting is one of the biggest changes you'll notice when you first drop back into Clarke's magnetized boots. But there are plenty of other changes as well. The game seems to lean a little more heavily on kinesis and the ability to throw object at enemies. The ability to slow enemies and object with stasis also returns. As does zero gravity, though this time around a player can disengage Clarke's boots and free float in space. A neat addition to the game. The game's second chapter gives you your first real look at just how different the setting will be this time around. The chapter opens with you working your way through the Sprawl's residential areas, towering apartment buildings packed with doors, darkened hallways and elevators. Plenty of places to scare the hell out of you. You'll find much more signs of everyday life in these settings, an opportunity to deliver many more unsettling discoveries, like a child's scrawl on a bedroom wall begging for someone to protect the family from "monsters." There is a sense of having just missed the inception of this latest Necromorph outbreak. You stumble upon signs of recent conversion, fights, hasty retreats and plenty of death. While a bulk of the game is still about carefully, strategically dismembering your enemies with plasma cutter and line gun, there are also some mini games and puzzle solving involved. The two I ran into involved remembering and matching symbols or finding points on a wheel to hack a computer or elevator. Even limiting my experience to just the second and third chapters of the game I was surprised at how much diversity the developers were able to cram into the settings. I found myself battle Necromorphs in eerily empty plazas, in crammed moving trams, running from them along no-longer-moving sidewalks and searching them out in darkened apartments. Those early chapters also reintroduce the notion of the Church of Unitology and their control over not only your struggles, but the people who live in the Sprawl. The elevators are decorated with propaganda for the cult. Later you find yourself fighting your way through a Unitology resource center and finally, seeking refuge in a large Unitology Church. It took me about an hour to get to the end of chapter three, the cut off point for these early impressions, but it was an adrenaline-pumping ride. A ride that left me wanting to continue the journey and unravel the mystery of Clarke's increasing psychosis and this latest infestation.